It looks to me as though the City Council meeting tomorrow night will be full of fun. The first public hearing will be Eric Bever's dredging up of the Aztec Basketball League issue. I guess, based on his public pron ouncements, old Eric is worried that a paying customer like this league will inflict unnecessary wear and tear on the basketball floor and other elements of the Downtown Recreation Center. Geez, that's what it's for, Eric! Right now it's severely under-utilized on Sunday and this contract resolves that issue. Do you think it's possible that, because Benito Acosta has taken an Aztec name, Bever doesn't want that word associated with anything in Costa Mesa? 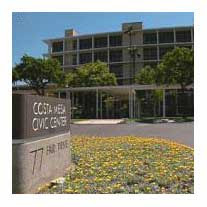 Then the council will tinker with the Mesa West Bluffs Urban Plan. This one makes me nervous because this particular council has demonstrated some strange behavior in the past on Westside issues. It doesn't make me feel any better knowing that our municipal racist laureate, our old buddy, The Mouth From Mesa North, will most likely be there, fanning the flames and telling the council to get off their butts and get things changed on the Westside NOW! Then they address permits for outdoor filming in our city... One must assume this was generated in response to the recent Trinity Christian Center dust-up... Passage of this amendment would preclude any organization that has already received a conditional use permit from the requirement of a specific permit to film on a specific date. Under "Old Business" the council will give second reading to an ordinance requiring all vendors who provide 15 or more shopping carts for their customer's use to install a method of guaranteeing that those carts don't stray from their parking lots and litter our neighborhoods with lost carts. Presently we pay a contractor to round up any stray carts to the tune of $48,000 per year. For the grand finale tomorrow night the council will consider an amendment to our contract with CalPERS to facilitate the proposed early retirement option that is part of the ten-point plan to balance this year's budget. I suspect this item might generate some interesting discussion. It's my understanding that the city hopes that 50 of the 145 people eligible for early retirement under that plan will do so, and that approximately half of those positions would not be filled. I think they may get a much bigger positive response to this plan, which may make life more than a little complicated for those department managers trying to maintain satisfactory service levels. The shopping cart deal is highly frustrating as a resident. Despite the fact that the shopping cart law is clearly posted, and the common sense knowledge that removing a shopping cart from store premises is wrong, we place the burden for people stealing shopping carts on the stores and public? This is not a problem associated with Costa Mesa alone. Shopping carts litter the Coronado North and South apartments in Newport Beach. We aren't Costa Mesa police officers citing everyone caught off store premises with a shopping cart? Sure, it would be a pain in the short term, and use lots of CMPD resources, but once people started realizing that they may get an expensive ticket if they take shopping carts off store premises, they'd stop doing it. Actually, the present plan seems to have been working... 48k annually to keep stray carts off the street seems reasonable. This new scheme is going to be a bear to administer and will almost certainly cause any future merchants considering Costa Mesa as a destination for a store to pause. We'll see. I think the win-win here is to outlaw shopping carts for all markets in Costa Mesa. The benefits are limitless. No wandering shopping carts cluttering up the landscape. I could go on and on, but you get the idea! Why doesn't the city just divide out the $48K cost amongst all the locations within the city that have shopping carts and charge it back to those locations. Another option would be to charge the store per cart retrieved. Either way would probably be cheaper for them then installing these systems to keep the carts in the parking lot. Then maybe they would police themselves to keep costs down. Hold on CM Girl and Geoff - if it is illegal to remove the carts, punish those removing them. Either that or lets go with Bruce's idea. It is also illegal to shoplift - are we going to go after the stores for allowing people to shoplift? Silly, I know - but so is penalizing the stores for "allowing" their carts to be stolen. Rob, the current system has been working just fine. Only the budget issue brings it up again. Previous councils have debated this subject and decided it was more prudent to pay slightly less than $50,000 per year to collect carts instead of unleashing police officers and/or code enforcement staff to apprehend folks rolling their groceries home. It was probably the correct decision at the time. "once people started realizing that they may get an expensive ticket if they take shopping carts off store premises, they'd stop doing it." That must be why people stopped running red lights and speeding, the fines.